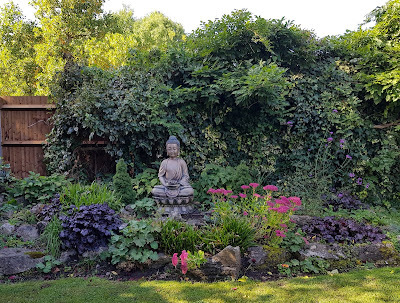 Choosing the planting for this rockery was one of my very first garden design jobs and I always appreciate the opportunity to return to gardens I have helped to create to see how they develop as the plants establish and settle. This planting is two years old now and the plants have matured and grown in an around the rocks. While it's always satisfying when the finished article looks much as you had envisaged it, sometimes plants grow together in unexpected ways and you can get a quite new, unintended but still appealing arrangement. It was completely bare of any vegetation when I took it on, something I now know is quite unusual - a completely blank slate to work with. 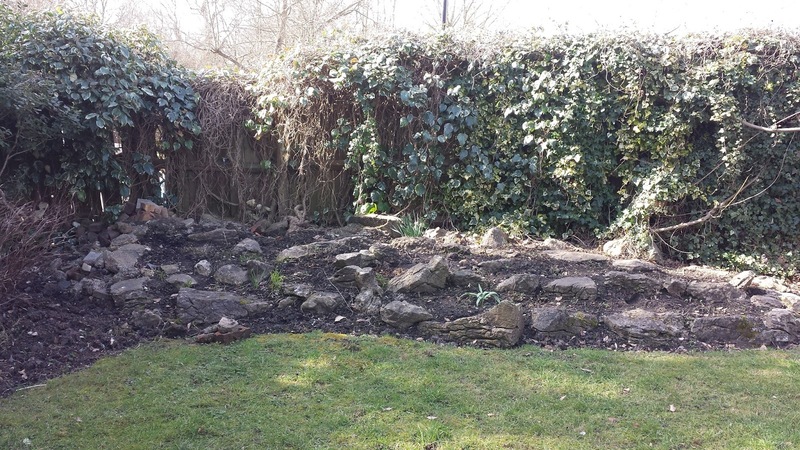 Although laid out as a rockery, it faces east and is predominantly shady. Paradoxically the north end is the brighter side, as trees and fencing overshadow it on the southern edge. So the conventional sun-loving alpine plants had to be set aside in favour of leafier shade lovers. When initially planted up, you can see the distances between plants quite clearly. The positioning of the rocks determined the spacing between plants just as much as allowing for their eventual spread. 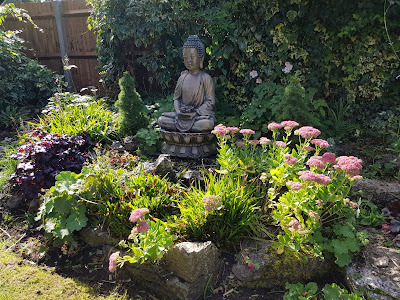 Two years on, and Buddha is sitting atop a wave of grasses, flanked by the two small conifers and the Japanese anemones as a backdrop. Tellima grandiflora provides background vegetation in spring and summer. The colour palette of mostly pinks and purples is designed to be visible from the kitchen window opposite at the far end of the garden. At this time of year, the sedums form pink cloudy cushions for Buddha, and the Verbena bonariensis will add colour until the first frosts. their seed heads will add structure to the evergreen leaves over winter and then in spring the bed comes alive with bulbs: crocus, dwarf daffodils, chionodoxa, and snowdrops, and then tulips and yellow and gold primulas. Plants that have done well in this somewhat unpromising environment include Heuchera - the 'Palace Purple' is crowding out 'Ginger Ale' and we will plant more 'Ginger Ale' next year to maintain the balance of light and dark leaves - Euphorbia myrsinites at the brighter end of the bed whose leaves look suitably alpine like, Luzula sylvestris, and the ferns. Tiarella puts on a brave display during the spring and early summer but is barely evident for the rest of the time, and Alchemilla mollis is beginning to self-seed satisfactorily. My efforts to establish Aubretia have come to nothing so far: too dark and damp, I suspect and I am now looking for something else that will fulfil an Aubretia-like function, ie, tumble over the stones with some bright flowers, which is also better suited to the conditions. The focal point within the bed was originally to be a single conifer, either a Juniper 'Skyrocket' or J. communis 'Hibernica', or ideally something slower growing. Buddha at the time was sitting rather lonely under a tree nearby and the client suggested moving him to the centre of the new rockery with his two conifer sentinels. He looked at home straightaway, and I swear his face has developed a smile since his move. We had another serendipitous discovery while preparing the bed for planting. 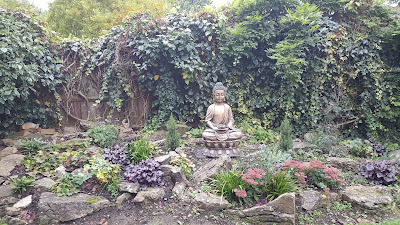 I cut back the ivy covering the fence behind quite dramatically and fund a few straggly and tattered wisteria stems underneath. By clearing a space around them and giving the wisteria more light it has shot up and this year gave us long racemes of blue flowers for a dramatic backdrop to the bed.